Travel the Alaska Railroad route and experience unmatched views and impeccable service on this 3-day mini vacation. Experience more time in the Denali National Park area, making sure to take part in the activities and optional excursions that make the area unique. Venture into the park on an optional Tundra Wilderness Tour, learning about the history of the park and its inhabitants like, moose, wolves and bears. Or, check out our array of optional excursions like a jet boat wilderness safari or fly fishing a glacial silt river. Enjoy dinner and a show at the Music of Denali Dinner Theater at McKinley Chalet Resort featuring family-style dining and a spirited original musical about the first men to reach the summit of Denali. Anchorage and Fairbanks accommodations are not included. The sights unfold before you as you journey between the mountains of the spectacular Talkeetna and Alaska mountain ranges aboard luxurious glass-domed railcar. Glide past small towns and flag stops and cross over the Hurricane Gulch trestle and other engineering marvels on your way to the famous Denali National Park and Preserve. 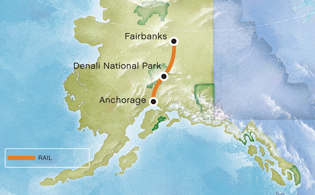 Arrive in Denali National Park and transfer to your hotel. Enjoy an evening at leisure or check out one of our several optional excursions, like flightseeing or an ATV adventure. Overnight Denali-area hotel.